There will be a 5K/10K Run/Walk and Fitness Blast on Sunday, January 27, 2019. 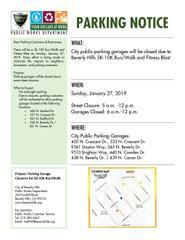 City public parking garages will be closed due to this event. Every effort is being made to minimize the impact to neighbors, businesses, and parking customers. - Redirection to other parking garages.